People in this day and age aren’t wired to wait. Yet without “the wait” our strength won’t be renewed. As the Bible declares in Isaiah 40:31, those who wait upon the Lord will not only renew their strength, but they will also mount up with wings like an eagle, they will run and not be weary, and they will walk but not faint! The Bible also tells us that the trials we go through in life are not in vain. Those are the very things that work in us patience so we will be lacking nothing (James 1:4). Let me be clear: the Lord doesn’t cause the wait to develop our character; the character that is developed in us during the wait is the icing on the cake as we wait for God’s appointed time! Now, I don’t know about you, but if you are anything like me, you probably don’t like to hear the word wait, especially when it’s in the same sentence as trials and patience. What do you mean “until”? Habakkuk 2:3 says, “For the vision is yet for an appointed time; but it speaks of the end, and does not lie. 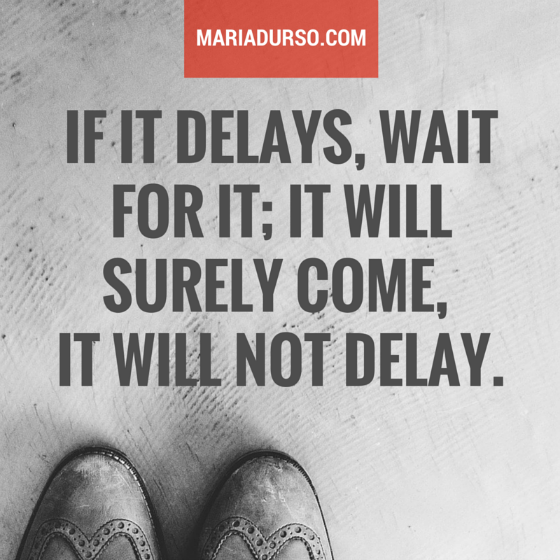 If it delays, wait for it; it will surely come, it will not delay” (mev, emphasis added). I do not like what this scripture is implying! What do you mean by “though it linger”? The thought of it is making me twitch! The word linger, which is sometimes translated “tarry,” seems to contradict the words “will not delay.” If I have to tarry or wait for it because it is lingering, then in my mind it is already delayed! But all kidding aside, you and I know that God knows the exact time your miracle is to come. Today, choose to do the next right thing while waiting on God’s promises in your life.